No less than Israel’s chief military advocate in Judea and Samaria – and dozens of others – were mobilized to keep two women Palestinian demonstrators in custody pending trial. Last week, the Israel Defense Forces proved once again how it spares no resources or manpower to defend the Jewish people from any danger lying in wait. This time the glory belongs to the military prosecution, particularly the chief military advocate for Judaea and Samaria, Lt. Col. Morris Hirsch. Eyewitnesses describe how, at the Ofer military court, he mobilized with great enthusiasm to defend us from those trying to harm us. On Friday June 28, our forces (the IDF and the Border Police) detained two serial threats to Israeli security: Neriman Tamimi, 37, from the village of Nabi Saleh, and Rana Hamadeh, 22, a native of Kabatia who is also a Canadian citizen. Within a week, in four sessions at two military courts, four judges, three prosecutors and several dozen prison guards, translators, drivers, soldiers and typists were recruited to keep the two women in detention until the proceedings ended. That doesn’t include the defense attorney, Neri Ramaty. The two women were detained in Nabi Saleh, whose inhabitants have been demonstrating for almost three years to get back their spring, which was appropriated by the settlers of Halamish. In the past two years Israeli soldiers killed two demonstrators in the village; one was Rushdi, Tamimi’s brother. He was shot in the back with live fire. On Friday June 28, several dozen demonstrators gathered in the village and marched to the wadi. Not one stone was thrown at our forces, and still they fired massive amounts of tear gas. The demonstrators scattered in all directions. Tamimi and Hamadeh ran down the mountain, bumped into two other demonstrators and decided to go back up to the village. Then soldiers appeared, said something in Hebrew, waved a piece of paper and detained the two women. That was at about 2 P.M. They were led on foot to the area of the spring in handcuffs. There they were placed in a jeep where they were blindfolded with flannel cloth. Blindfolded and handcuffed, they spent about eight hours being driven in the jeep and at two military camps. Only during a short break for an examination by a military doctor were the blindfolds taken off. Tamimi and Hamadeh were brought for interrogation at the Benjamin police station shortly before midnight. 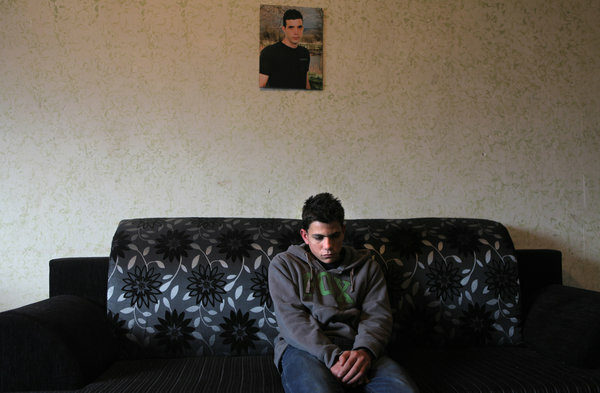 They were left outside, in the cold of the Ramallah hills, until each was summoned to an investigating police officer. They maintained the right to remain silent. Only at 10 A.M. Saturday did they arrive exhausted at the Hasharon women’s prison. About 40 hours later, 2 A.M. Monday, the two were placed on the “bosta,” the bus that takes detainees to the courts. They arrived at Ofer about five hours later. The deliberations on extending their detention began at 10:20 A.M – that was already the second session. On Sunday in their absence, the military judge, Maj. Sharon Keinan, acceded to attorney Ramaty’s request and ordered their release on bail. He didn’t understand what was so dangerous that it required keeping the two women in detention, as the police requested, even if they had violated an order concerning a closed military area. The claim that Hamadeh was guilty of verbal violence did not astound him. Military prosecutors filed an appeal, which was discussed the next day in the presence of Tamimi and Hamadeh. They were brought from the cell to the courtroom with their legs in chains and their hands in plastic handcuffs. In the courtroom only their hands were freed. 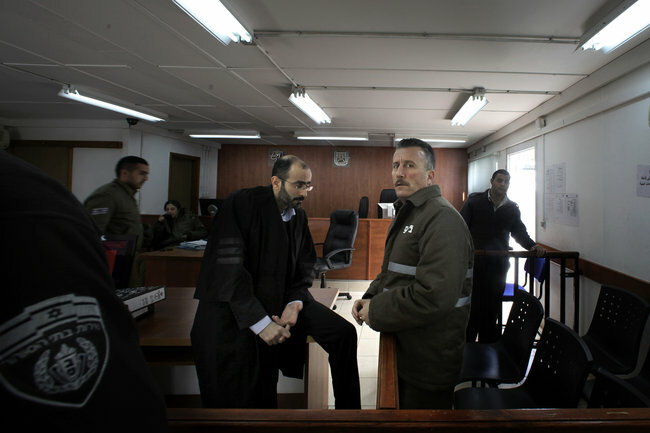 The judge of the Military Court of Appeals, Lt. Col. Ronen Atzmon, told the prosecutor, Capt. Gilad Peretz, that it did not appear the two women’s acts were dangerous enough to justify detention until the proceedings ended. Peretz summoned reinforcements: Hirsch, the man in charge of the prosecution. Judge Atzmon ordered their release. “The nuisance and the anger that the respondents cause the security forces do not constitute a reason for detention,” he said. At 10 P.M. the two women were released to their homes. On Tuesday July 2, they were told to return to the court, where the diligent prosecutors filed the indictment. Both are accused of violating an order regarding a closed military area, and Hamadeh is also accused of interfering with a soldier. Prosecutor Peretz once again spoke about their past, about the fact that they specifically went down to the dangerous area near the wadi. Attorney Ramaty claimed that the order on the closed military area was unclear and gave examples of Jews who were not detained until the end of proceedings despite previous convictions. In one case, one detainee who was freed had 27 previous convictions of attacking policemen. The prosecutors were partly successful. The military judge, Maj. Shahar Greenberg, sent the two women to house arrest until the end of the proceedings, but acceded to Ramaty’s request to postpone implementation. The prosecution quickly appealed the postponement, which was discussed on Thursday – by no less than the president of the Military Court of Appeals, Lt. Col. Netanel Benisho. He ordered house arrest for the two women, on Friday July 5. Does that mean we have to fear for our safety until another judge rules on the prosecution’s demand? Photo by Rina Castelnuovo for The New York Times: Islam Dar Ayyoub was taken from his home, then pressed to inform on his relatives, neighbors and friends. His brother Omar, in the picture above, is in prison. Photo by: Rina Castelnuovo for The New York Times Bassem Tamimi, above right, with his lawyer, was informed on by his teenage neighbor. Now on trial, he denies having told anyone to throw stones. Major Sharon Rivlin, a judge at the Ofer Military Court, accepted as admissible the testimony of a 14 year-old Palestinian boy who was unlawfully arrested in the dead of night, questioned without being allowed sleep, denied his right to legal counsel and not told of his right to remain silent. He was denied his right to have a parent present during his questioning. The testimony of one of his interrogators before the court suggests that he believes Palestinian minors do not enjoy this right. 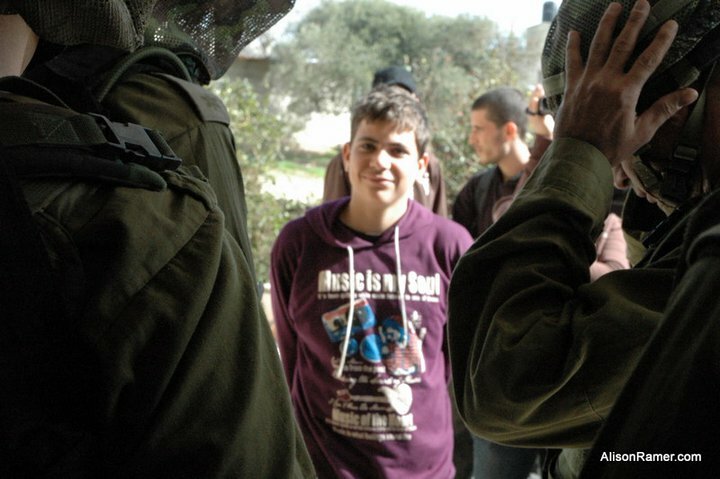 The abovementioned Israeli Youth Law and the protection it is meant to ensure for minors during their interrogations is not officially part of the Israeli military code for trying Palestinians in Israeli military courts. However, the Military Court of Appeals repeatedly ruled that it should be applied when interrogating Palestinian minors in the Occupied Territories nonetheless. Nevertheless, the military judge determined that the boy’s confession should not be ruled inadmissible, saying that “In my opinion, the infringement on the defendant’s rights in this concrete case, did not amount to a violation of his right in a way that will sufficiently endanger his right to a fair trial […].” The decision was made despite a psychiatric expert opinion handed to the court which determined that a boy of 14 undergoing such an interrogation could not be considered to have given a statement of his own free will. See here for the defense’s closing arguments (in Hebrew). See here for the judge’s decision (in Hebrew). Jalal Aweida, an Israeli police inspector, will testify about his involvement in the unlawful interrogation of a 14 year-old boy as part of the trial of Nabi Saleh protest organizer, Bassem Tamimi. Following recent escalation in violence employed by Israeli forces towards protesters in Nabi Saleh, including the fatal shooting of Mustafa Tamimi and the use of live sniper-fire, the Israeli Military Prosecution will resume making its case against West Bank protest organizer from Nabi Saleh, Bassem Tamimi, this Sunday at the Ofer Military Court. A previous hearing saw another police interrogator admit to having systematically infringed on the rights of Palestinian minors. 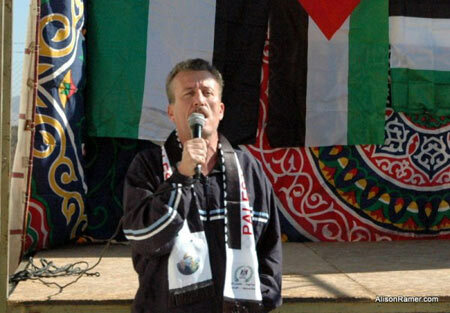 The hearing will include the testimony of Inspector Jalal Aweida of the Israeli Police. Inspector Aweida was one of the key interrogators of 14 year-old Islam Dar Ayyoub – Tamimi’s main incriminator. Aweida also served as one of the officers in charge of the broader investigation into the Nabi Saleh demonstrations. In his interrogation the morning after his arrest, year-old Dar Ayyoub alleged that Bassem and Naji Tamimi organized groups of youth into “battalions”, assigned with different responsibilities during the demonstrations: some were allegedly in charge of stone-throwing, others of blocking roads, etc. The video recording of the boy’s interrogation also shows Aweida making threatening gestures towards him – that included Karate moves and punching his fist into his hand, mocking him, making sexual innuendo in regards to Islam and the female police officer who was in the room. The video also shows Islam bursting into tears halfway through the interrogation as well as nearly collapsing of tiredness. Tamimi’s trial began more than nine months ago, which Tamimi has spent behind lock and key. The trial of Nabi Saleh protest organizer, Bassem Tamimi, is due to resume this Wednesday with the testimonies of two main witnesses. The progress of the trial was hindered last week, for the fourth time since proceedings began, after the main witness in the case, fourteen year-old Islam Dar Ayyoub, was not summoned to the hearing due to the Military Prosecution’s negligence. Tamimi has already spent more than seven months behind lock and key, but only five of the 25 prosecution witnesses have been heard to date. The two witnesses scheduled to be heard on Wednesday are both youth from Nabi Saleh – fifteen year-old Mo’atasem Tamimi, and nineteen year-old Oudai Tamimi. Mo’atasem Tamimi, the fifteen year-old, was grabbed from his bed at gunpoint in the middle of the night on January 27th, 2011, and questioned unlawfully the next morning. The official transcript of his interrogation, provided by the police, shows that Mo’atasem incriminated Bassem and Naji Tamimi of instructing youth to throw stones, and confessed to having thrown stones himself. However, a video recording of the interrogation reveals important details, omissions and gross discrepancies between the transcript and the actual interrogation. Udai Tamimi, the 19 year-old, is employed by the Palestinian security forces and was, according to the police, only present at one demonstration. He denied all charges against him in his first interrogation, then confessed and incriminated others, including Bassem Tamimi, in his second questioning. However, he then recanted his statement in his third interrogation, saying he was beaten before his second questioning.